Anyone who has driven a car with CVT will have comments about the difference in the drive. 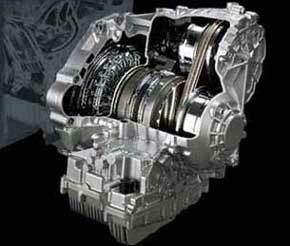 The Continuously Variable Transmission is basically a type of automatic transmission. Without driving the vehicle and just looking at the gear lever you will notice that is exactly the same as a conventional automatic and it does the same thing as the an automatic which is convert the engine's limited range of speed to various ratios automatically to be sent to the driven wheels using a number of different gears. This difference between the automatic transmission and CVT is the number of gears. The automatic is limited to 4 to 9 gear ratios and there are definite or noticable changes between the gears and this is felt during driving. 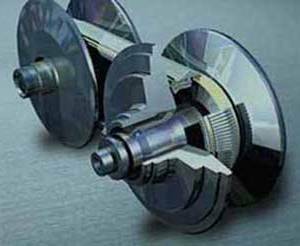 The CVT has what is termed an infinite number of ratios ranging from low to high and the transmission move through the gears steeplessly according to the driving situation. Even though the term infinite is used, the lowest ratio will be close to the first gear in an automatic transmission and the highest ratio will be close to the highest gear in a regular transmission. All continuously variable transmissions are not the same, some are made to handle more power as there are CVTs for economy sedans and some for vehicles fitted with powerful engines. This transmission is simple in design with a few components comprising of these parts. 2 Pulleys, a variable input pulley which spins from the power provided from the engine and an output pulley that sends the power to the driven wheels. A high power/density rubber or metal belt that connects the 2 pulleys and is used to vary the ratios between them as the vehicle is being driven. There are also various microprocessors and sensors as the transmission must be able to detect the driving conditions. Continuously Variable Transmissions provide better fuel economy by allowing the engine to run at it's most efficient RPM for any range of engine speed. Vehicles with CVTs drive smoothly as persons in the vehicle don't feel any jerks from gear changes but that wasn't any problem with people. It is said that a CVT vehicle can accelerate faster than a conventional automatic and some might want to argue that it can accelerate faster than a manual transmission but I don't see CVTs being used on performance oriented vehicles. An improved fuel economy and providing a smoother ride for passengers is where the CVT benefits are most noticed.